This is the wrist blood pressure monitor that provides superior accuracy and ease of use. During testing by the Hammacher Schlemmer Institute, its systolic and diastolic measurements were compared to readings taken by a nurse. The monitor’s results deviated from the nurse’s by an average of only 8.5 mmHg—making it over 25% more accurate than lesser models. It has easy one-button operation and automatically inflates and deflates to provide systolic, diastolic, and pulse readings. It displays large, easy-to-read numbers on its LCD and color-coded indicators that allow you to quickly determine where results fall on the World Health Organization’s guidelines. It has irregular heart beat detection and stores up to 120 readings for two people. Fits wrists from 5 1/2"-7 1/2" in diameter. Includes storage case and two AAA batteries. 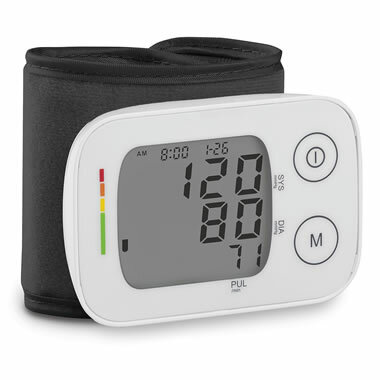 The Superior Wrist Blood Pressure Monitor comes with The Hammacher Schlemmer Lifetime Guarantee. Items that we sell are guaranteed for their normal life under standard non-commercial use.